Here at Mikes Bikes we are more than just a bike shop; we are an experience and if it involves bikes then the chances are we do it! We sell everything from £200 bikes and balance bikes to top end race machines for mountain or road biking. We are also proud to be one of the only Specialist Electric Bike Shops in Scotland, we have a huge range of electric bikes in store starting from just £1600 and if you fancy trying before you buy we are proud to have a fleet of electric demo and rental bikes. 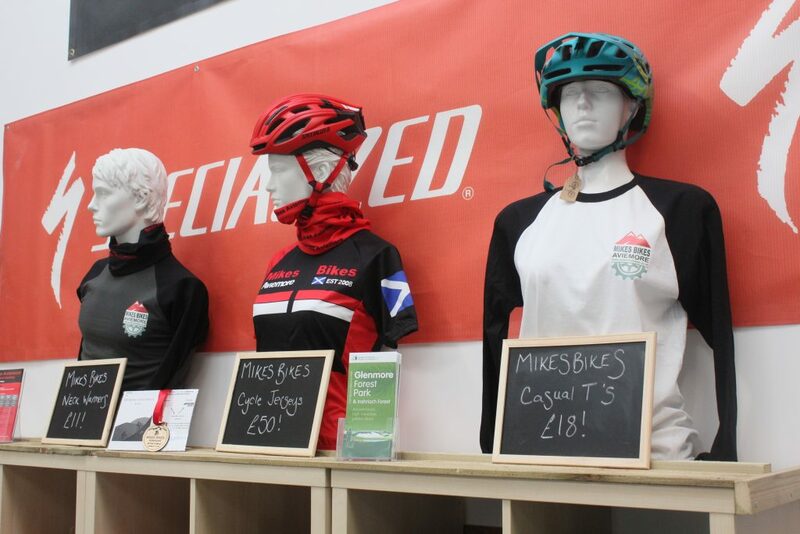 We strive to help you enjoy your experience in store whether you are buying a pump, clothing or a new bike. We have a large stock of bikes in store, if you are after a specific bike and you can’t see it on the shop floor then it’s more than likely we can order it. Turnaround for bike orders is generally 1 – 2 days. All bikes that are bought from Mikes Bikes are fully built and come with a free first service. And where applicable we will do a full bike set up with you. Trade in’s are also considered when you are purchasing your new bike so mention it if you are considering a new bike. Likewise If you are looking for a cheaper bike then ask us what second hand bikes we have. Mikes Bikes Custom Kit – Now available to purchase! Our workshop is equipped to deal with on the spot repairs and has a quick turn around time. Our mechanics hold various industry certificates including Cytech and Bosch & Yamaha Electric bike servicing certificates. We also offer bespoke builds in our workshop. But we don’t just fix and sell bikes and that’s what makes us different. Throughout the course of the year we hold lots of events you can check out what we have happening in our events section. We offer a service that the internet doesn’t. You can’t hire a bike online, you can’t demo a bike online, you can’t fix a bike online and you can’t go to events online!